In 701, the capital of Japan was based in Nara. At this time, Isagawa Shrine was responsible for hosting the Saikusa Festival on behalf of the government until the festival was discontinued around 1000 (middle of the Heian era). 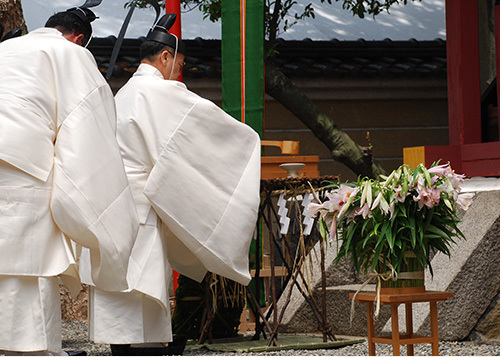 In 1881, the festival was reintroduced by Isagawa Shrine, and to this day, people come to the Saikusa Festival to pray for protection against diseases and disasters. 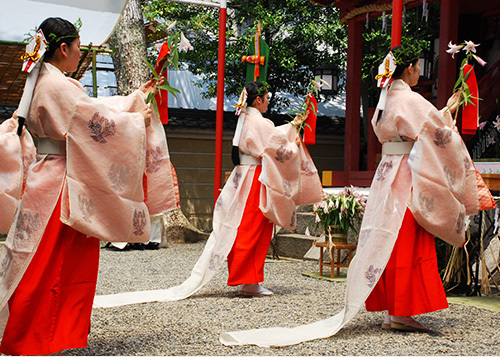 During the Saikusa Festival, two barrels of sake are offered to Empress Himetataraisuzuhime no Mikoto. The festival is unique in that both barrels, one filled with white sake and the other with black sake, are decorated with Japanese lilies. The Japanese lilies symbolize the flowers that grew at the base of Mount Miwayama where the empress lived. It is said that the offering will bring the empress happiness in her afterlife.